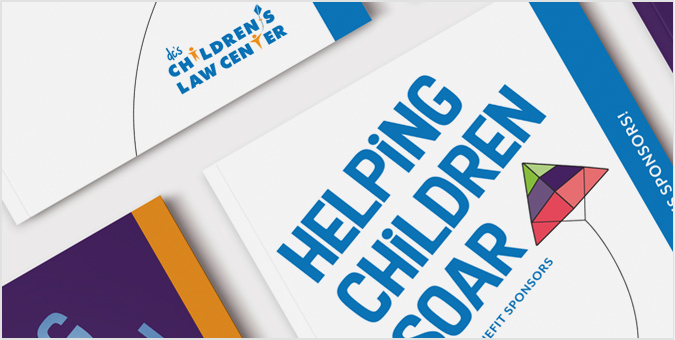 As the largest provider of free legal services in the District of Columbia, Children’s Law Center (CLC) services more than 2,000 at-risk children and their families each year working to give them a solid foundation of family, health, and education. Every fall, hundreds of generous leaders from the business, legal, political, medical and philanthropic communities gather for the Helping Children Soar Benefit, a fundraising event and celebration that helps CLC achieve its mission. With kite illustrations at the center of CLC’s visual identity, we borrowed the same whimsical imagery to develop a suite of custom print and digital collateral, including invitation package, event program, signage, PowerPoint, and more.